Many YouTube users have once met some issues when they want to convert YouTube to MP3 on Mac for iTunes, iPhone or iPod shuffle. For example: some of them can not find the best YouTube to MP3 converter Mac, some other users don't know if there es a site to convert YouTube video to MP3. In a word, do you know what to do if you can't extract MP3 from YouTube? If you have no idea, this article must be helpful to you that here will share you the complete guide on how to convert YouTube to MP3 format on Mac (macOS Mojave, High Sierra, Sierra, El Capitan, Yosemite, Mavericks, Mountain Lion, Lion, Snow Leopard), as well as 19 recommended online YouTube to MP3 converter tools. For Mac users, iTube Studio YouTube Video Downloader is such an application to convert YouTube to MP3 in one click. This smart YouTube to MP3 converter for Mac can automatically detect YouTube videos and download them. It comes with a "Download MP3" button so that you can directly download YouTube videos or YouTube music to MP3. One click download YouTube 4K videos as well as videos from Vimeo, Dailymotion, Facebook, VEVO, Metacafe, Break and 10,000+ online sites. Download YouTube to MP3 in high quality, or convert YouTube to MP3, M4A, WAV, etc. and directly export MP3 from YouTube to iTunes. Optimized presets for iPhone, iPad, iPod, Android phones, tablets, PSP, Playstation 3, Nintendo Wii, Xbox 360 and more. Convert existing or downloaded FLV/MP4/WebM video files to MOV(QuickTime), MP4, WMV, AVI(XviD), MPEG, 3GP, MKV, etc. Transfer downloaded or converted YouTube MP3 or videos to mobile devices with USB cable to enjoy anytime you want. Easily download cloud storage backup media files from Dropbox, One Drive, Google Drive, Box.com, etc. Private Mode to protect your video downloading information with a password known by yourself only. When launch this YouTube MP3 converter on Mac or Windows PC, you will see the "Download MP3" button in the drop-down box on top left corner of the main interface. Simple copy the YouTube video address and press this button. And your video will be downloaded automatically. Alternatively, you can launch the program and go to YouTube. A "Download" button will show up at the top left corner of the video when it is detected on the webpage. Click the button and select "MP3", and let the YouTube download wizard to do the thing for you. Also it is easy to download YouTube playlist to MP3 if you want. 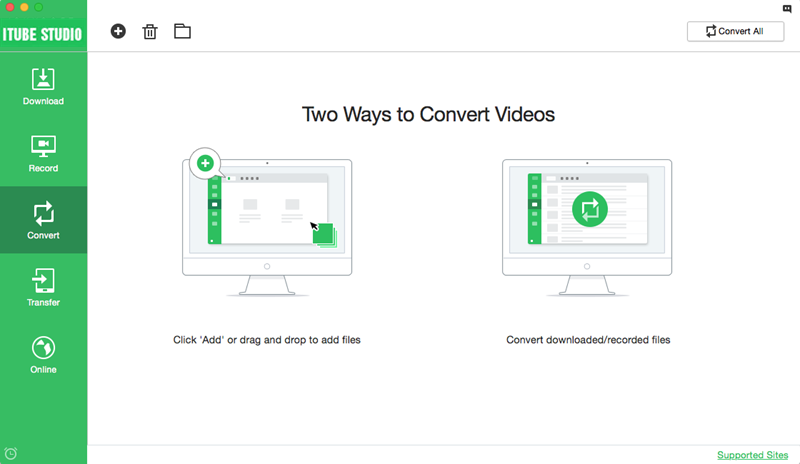 To convert existing YouTube video files, first import them into this list. To do so, go to "Convert" tab, click the "Add" icon on the top of this window to import YouTube video files to this program. Just click on the "Convert" icon on the right of any video item and a format choosing window will show up. Now choose MP3 from output format list. After selected "Audio" > MP3 from the popup window, hit "OK" and let this smart youtube to mp3 converter to do the rest for you. Bingo! You did it! Get iTube Studio YouTube MP3 Downloader for fun! Now you can easily save songs from music videos to MP3 for your iPod. 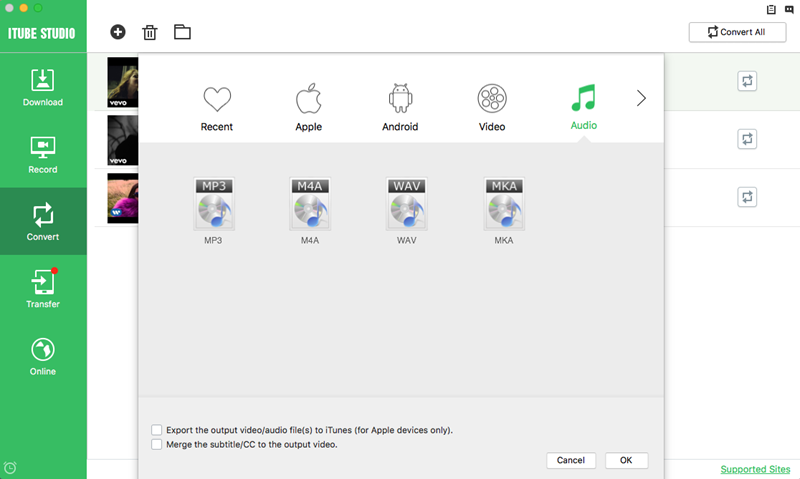 Similar to this way, you can also import YouTube videos to iTunes on Mac. Perhaps you can also try this method to convert YouTube videos to MP3. Launch iTube Studio, you will find a "Record" button on the top of the "Record" tab. 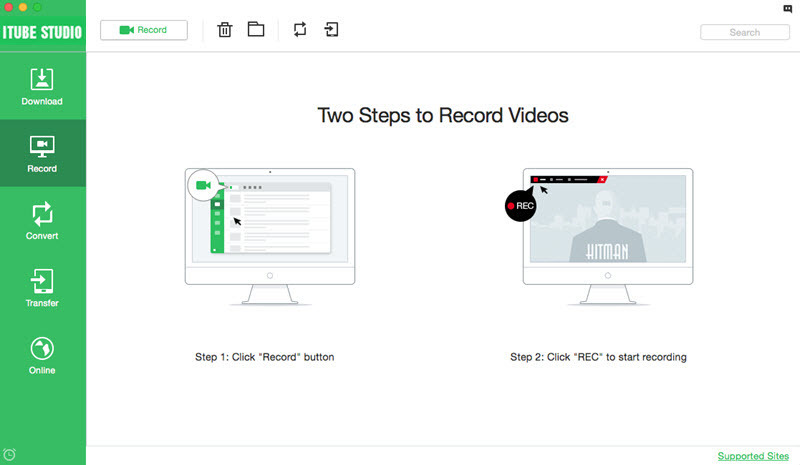 Then open the YouTube video you want to convert on Mac, and click the "Record" button, it will begin recording the video. You can set your video recording duration by click "Stop at" button. When the recording process completes, in "Downloaded" tap, you will find the recorded video. Hit the "Add to Convert List" icon to import video file to "Convert" tab. Then click the "Convert" icon and navigate to "Audio" > MP3 from the pop-up windows, you can also complete the process of YouTube to MP3 converting. 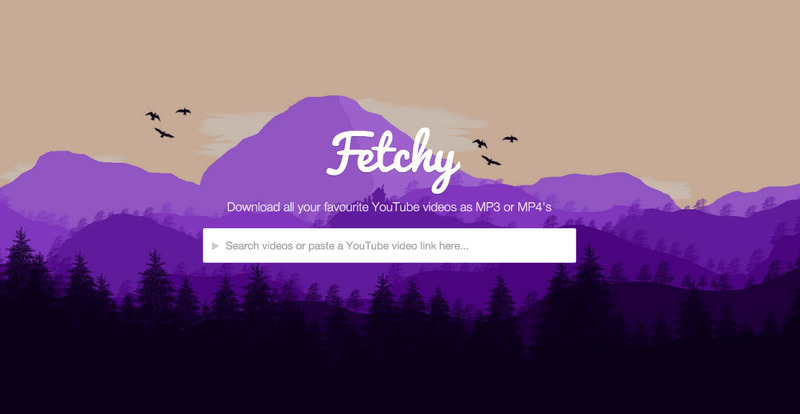 Fetchy is a beautifully simple YouTube to MP3 converter, with the ability to convert YouTube videos to both MP3 & MP4 formats, allowing you to enjoy videos and music online and offline. ?Fetchy sets itself apart with its clean design and multiple video quality options, while also allowing its users to browse YouTube videos right from the home page. When converting YouTube videos to MP3 Fetchy grabs the highest possible quality audio for the optimal playback experience. YouTube-mp3.org is an easy-to-use online tool for you to extract MP3 from YouTube videos by converting. 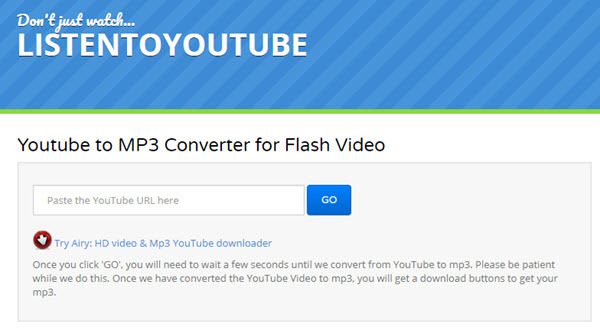 You can convert videos from YouTube to MP3 format on the site without registration. What you need is a YouTube video URL. 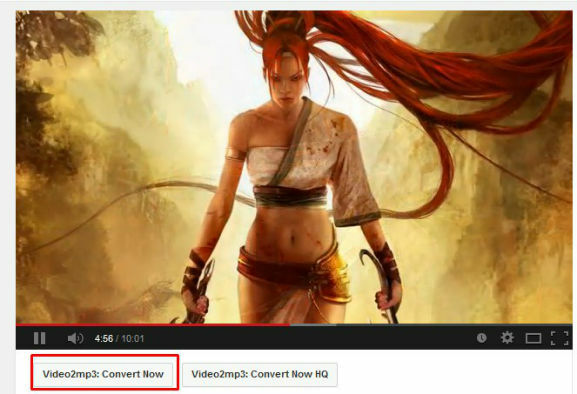 You simply copy the YouTube video URL and paste it to the site, and then click "Convert Video" to start the conversion. After that, download the converted file to your local hard drive. However, many users have encountered many problems when they are converting YouTube videos, if you also meet issues, the article "Fix 'YouTube-MP3.org Not Working' Issues" will help you solve them. ConvertMeMP3.com is a website providing a YouTube video to MP3 converting service. 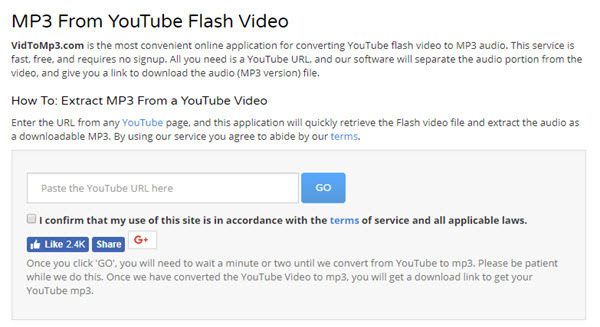 After entering the website, you can quickly learn how to convert YouTube to MP3. You only need to enter the URL of your YouTube video and select the desired audio quality. Hit the Create MP3 File button to start the process. After the time, which this takes depends on the file size, but you should have access to the MP3 file rapidly. 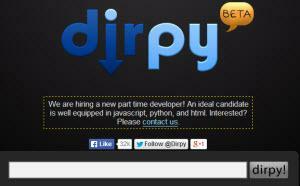 Dirpy.com is a slightly more complicated online YouTube to MP3 converter. It actually records the YouTube videos to MP3 files. After entering a YouTube video URL on the website, you will be led to a page with more options such as setting the recording time and editing the tags. Note that you should press the Record button to get the MP3 file, or else, you may attack and damage your computer by clicking other buttons. VidtoMP3.com allows you to convert video URL to MP3 files on the website. Apart from YouTube, it supports a number of other sites including MegaVideo, Dailymotion, Metacafe, Veoh, Myspace and many more. You only need to paste the video URL into the website and click Download to start the conversion process. ListenToYouTube.com is another online service for converting YouTube to MP3 files. It is fast, free, and requires no signup. Enter the URL of any YouTube page in the blank box and click Go. After that, the website will begin to retrieve the flash video file and extract the audio file to download as an MP3. Video2MP3, as an online service, converts videos from YouTube to MP3 files in the easiest way. All you need to do is to enter the URL in the box and click the Convert button. Wait for a few minutes to get the MP3 downloaded to your computer. It's just that easy. Vixy Freecorder is a desktop program that enables you to download videos and convert videos to MP3 files. It supports quite a lot of video sites like youtube, Vimeo. And It can also act like a screen video recorder. flvto.com provides an easy way to convert online videos to MP3. 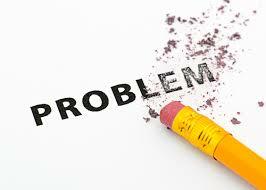 It works on every operating system including Windows, Mac and Linux. You can paste the YouTube video URL into the box and select to convert to MP3. After some time, you will have the audio file on your computer soon. Ytconv.net is an online YouTube to MP3 converter that provides the most convenient way to finish this important task. Enter your video URL into the box and select MP3. You can also select other formats like FLV, 3GP. Finally, click Convert to get your file. 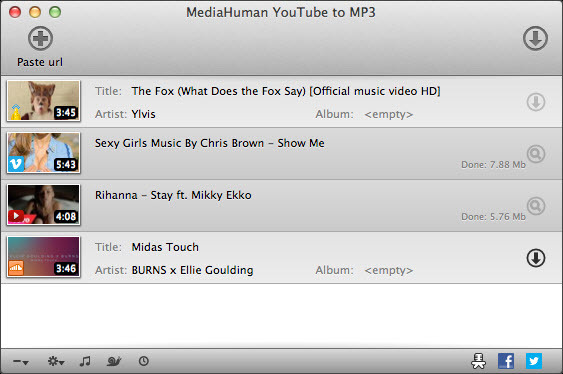 MediaHuman YouTube to MP3 is a desktop program, which that allows you to listen to YouTube or Vimeo music offline. It supports Windows, Mac and Linux. 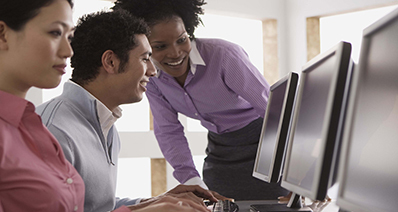 With its user-friendly interface, you can quickly and intuitively learn how to use it once you install and launch it on your computer. Keepvid.com downloads and converts all the YouTube videos. You can copy and paste the video URL into the box and get the MP3 files quickly. It also gives you the ability to convert YouTube files to other formats, like MP4, 3GP etc. YouTube to MP3 is a Firefox add-on that is only applicable to the Firefox browser. It is actually an add-on provided by Video3MP3.net. When you are viewing a video, you only need to click on the link to convert it to MP3. 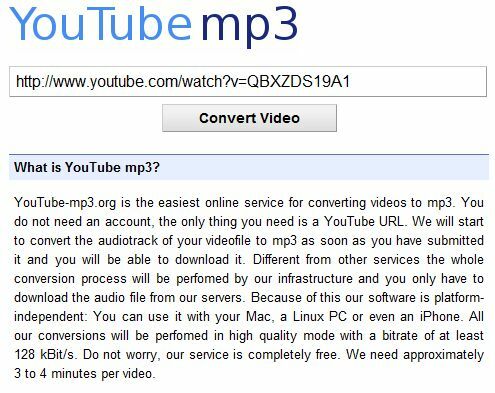 Yt to MP3 is a free online converter that enables you to listen to YouTube music on your iPod, iPhone and other media players. Go to the website and paste the video URL into the box and then click Convert. You will be able to access the audio file very quickly. 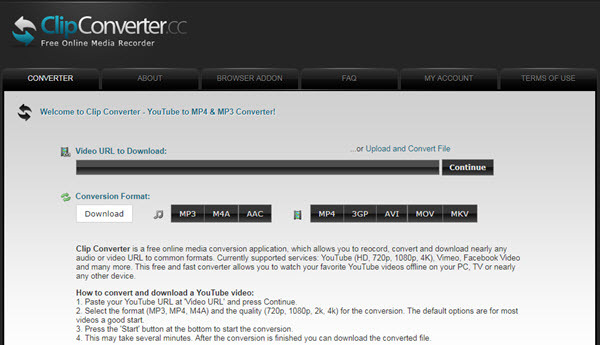 YouTube to MP3 Free Converter again is another add-on that only works on Firefox. 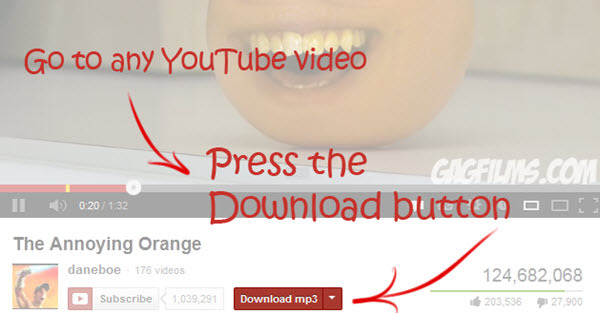 It inserts a download button on the video page and when you play the video, you can click the button to get the MP3 file. YouTube To MP3 PRO is another Firefox add-on that can convert any YouTube to MP3 instantly. It will also add a download button to the page when you play a video on Firefox. ClipConverter.cc is an online media converter that allows you to download videos and also convert to MP3 and other formats. After you paste the URL into the box and press Continue, you need to select a format such as MP3. Finally, click Start to convert the video to MP3. 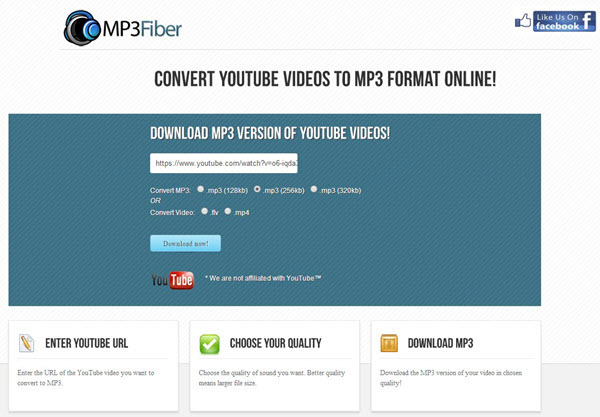 MP3Fiber allows you to convert every YouTube URL to MP3 and it also enables you to select the quality of the audio that you want. Paste the url to the box and it offers the options of audio and video formats. Choose the one you need and start the conversion of the video. music-clips.net allows users to convert YouTube videos to many formats including MP3, AAC, MP4 and many more. It is completely free and easy to use. You only need to paste the URL into the website and click Convert to access the video. Install and launch the YouTube to iPod MP3 converter. Find the YouTube video or music and download it by copying URL. Import the downloaded file to "Convert" tab, click "Convert" icon to convert the downloaded YouTube to MP3 iPod. MP3 is also known as the MPEG-1 Audio Layer. Created by the Moving Pictures Expert Group, this format uses the lossy algorithm to store and play audio clips, thereby effectively reducing the storage space needed to compile the file without affecting the quality of sound too much. The popularity of this file format was and still is phenomenal over the internet. It is currently the format of choice as far as music files are concerned. It is also the type of file most shared over a peer-to-peer network. When the ripping of CD’s to create MP3 files became possible, many record companies claim that such an act is a copyright infringement. An MP3 file is predominantly characterized by its bit rate. The higher the bit rate, the closer the output will be to the original sound. However, an MP3 file with a higher bit rate would also mean a bigger data file. 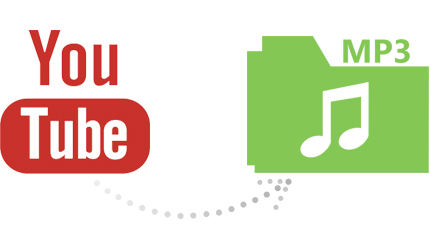 Want to upload MP3 to YouTube for sharing? YouTube does allow you to upload audio or image files as long as you convert the audio and image files to the format that will work on YouTube. And you must make sure you have the copyright of the content you want to upload. To upload MP3 to YouTube on Mac, you can use iMovie to help you to convert MP3 and an image to a .mov video file that YouTube supports (If you are using a Windows PC, you can use Windows Live Movie Maker for help). Step 1. Launch iMovie and drag an image and the MP3 file to the project area. Step 2. Adjust the duration of the image to fit the duration of the MP3 audio track so that the file can be uploaded properly. To do so, in the green box, click the gear icon > Clip Adjustments. Copy the number under Source Duration for the audio track. Mouse over the image and click the gear icon > Clip Adjustments. Then enter the number you have copied. Click Done. Step 3. Click the Share button and select the option of Export using QuickTime… Give a name to your file and click Save. Then you can upload the converted MP3 to YouTube site.